In a push to win Washington State, Team Bernie Sanders is setting up a temporary camp on Capitol Hill. The Democratic presidential candidate’s campaign has inked a one-month lease for empty retail space at the corner of E Pike and Boylston, according to real estate agent Nathan Belo who handled the lease. The campaign selected the Capitol Hill location because of its high foot traffic and visibility, as well as its proximity to downtown and the University of Washington, Kato said. The neighborhood has already been a hot bed of activity with volunteer phone banks and organizing efforts for the 74-year-old democratic socialist. The temporary headquarters will give organizers a place to gather resources and volunteers as the Sanders campaign makes its push for the Washington Democratic caucuses on March 26th. “I would describe it as managed chaos,” one Democratic official told CHS. “But it can be a lot of fun. It’s an opportunity for neighbors to talk about things that are important to them and form relationships.” How does the whole thing work? Here’s how Seattle picks a president. The former home of Dr. Jen’s House of Beauty has been empty since the outspoken owner of the craft cosmetics concern pulled out of Pike/Pine in the summer of 2015 leaving a few choice thoughts for the neighborhood in her wake. As of Friday morning, there were no signs of any activity in the space and a pile of leavings from the most recent doorway camper was strewn around the sidewalk. 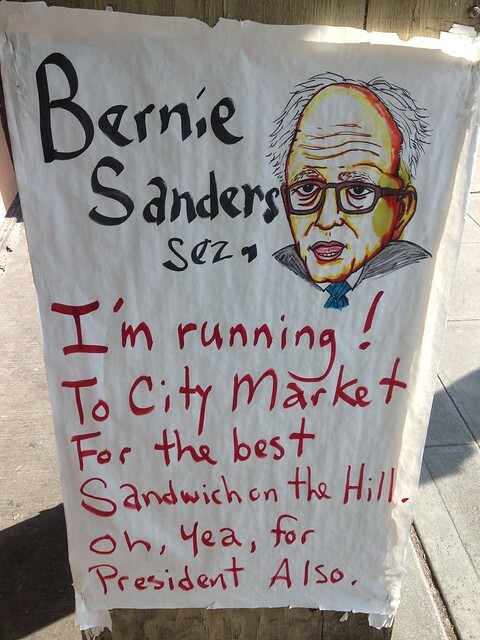 The Sanders camp’s choice for what is currently planned as a short stay is a different variety than Socialist Alternative City Council and Bernie champion Kshama Sawant chose for her campaign in a 10th Ave E building slated for demolition for a planned microhousing project in the shadow of Capitol Hill Station. With a variety of commercial space available in the neighborhood, Capitol Hill has been the headquarters for other recent, smaller-scale campaigns. In 2013, Tim Burgess also chose an E Pike address for his short-lived run at the mayor’s office. Capitol Hill resident Ed Murray later picked the same space for his successful mayoral campaign. But we’re not aware of headquarters activity on the Hill in previous presidential races — and we’re not sure if or where Camp Clinton is located in the city. Both campaigns have already passed through the neighborhood in their quests for the 2016 Democratic nomination. 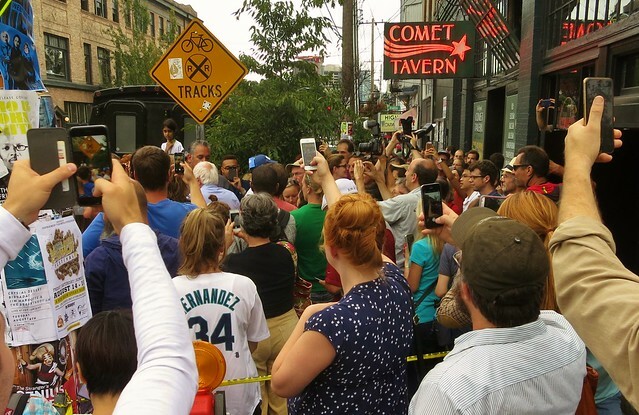 In January, ex-president Bill Clinton attended an HRC fundraiser as the Century Ballroom that turned 10th Ave into a fun-filled Bill fest while in August, Sanders swung through the Comet, of all places, to speak to supporters and raise some cash. Like Sawant’s Socialist Alternative run, the Sanders camp has made much of its “grassroots” fundraising and record number of small donors. Kato said the Sanders campaign is planning to open up more offices around the state in the coming days. This entry was posted in News, etc. and tagged elections, pike pine, politics by CHS Staff. Bookmark the permalink. That space wasn’t totally empty ever since Jen’s House of Beauty left – it served as the temporary leasing office for the Ava Capitol Hill apartment building across the street. Awesome! Are they looking for volunteers by any chance? I’m working part time now and I’d love to get involved and help out on my days off. I guess they have to be near where all those well-off white people live on Capitol Hill. The Rainier Valley would be too hard for the college educated white Bernie Bros to travel to. Man, I hope Bernie gets elected so I can stop paying my student loan. That $80K of Stanford debt is eating into my six-figure salary at Amazon. If I drop that, it’s hello Tesla Model S 85d, hello retirement at 30. Are these distortions you learned from the mainstream, corporate, righting, whatever they call it now media, or did you come up with that yourself? Here are the facts on Bernie’s education plan. And on other important issues. I assume you’re being satirical, Amazon….at least I hope so! Also, I lived in Vermont for 12 years (over 8 years ago) where he was our state rep, worked across the street from the offices of Mr. Sanders, and frequently talked to him over bagels. So I might be a wee-bit more aware of his policies than most. On the plus side, he’s the same guy today he was back then. On the minus side, he’s the same guy today he was back then. Thanks. I thought I was the only one. The one issue kids for Bernie. Now he wants a contested convention. I knew he was like Trump. Neurotic. Unqualified for President. Again his extreme right wing thinking has him foaming at the mouth in favor of Hillary who wants MORE war-what a dumbass!